Remember how short my Year In Retrospect post was a couple of weeks ago? That’s because things were happening and I couldn’t talk about it yet. Now you get the full story of My Year 2013 aka The Year I Got An Agent. 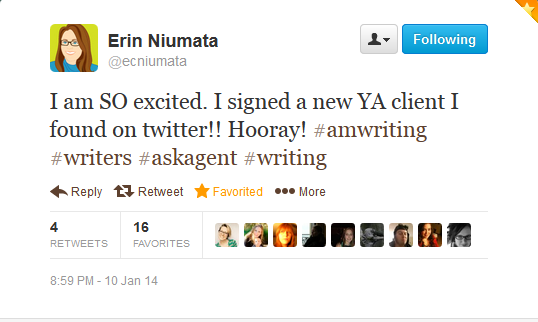 I’m thrilled to announce that I’ve signed with Erin Niumata of Folio Literary Management. The manuscript which helped me find an agent is entitled LILY IN THE SHADOWS and you can find out more about it here. Here I’d like to point out that even if you’re querying successfully (i.e. you’re getting requests, positive feedback and R&Rs), the querying process can take a long time. I’ve read MANY posts by writers who signed with their agents only a couple of months after sending out their first query. It’s not necessarily the norm. Out of the 13 agents who read my full manuscript, the quickest one took 1 week and the slowest one 4 months. Their average reading time was 10 weeks. 2010 I write a sci-fi novel and ask my former English teachers to read it. Incredibly, they don’t think my idea of getting it published is crazy. 2011 I start 4 novels, and can’t finish any of them. I start reading about this whole publishing business. I read Claire Legrand’s blog and daydream that one day, I’ll have an agent too. 2012 I start a blog. I write a YA Epic Fantasy. I query it, get a couple of requests, and lots of rejections. I find a Critique Partner. I read Susan Dennard’s blog and decide to follow her amazing advice. I open a Twitter account. I join the ROW80 fun. I shelve my YA Epic Fantasy. I have a notebook. On the first page, I’ve written “Flower girl in Victorian London”. After watching Les Miserables at the cinema, one evening at the castle, I decide it’s time to write epic stories again. I sit down and open a Word document, with the title “Lily In The Shadows”. Thanks to the ROW80 sprints (every day at 2pm EST), I write 20k words. I research Victorian London. I outline. Every time an agent mentions somewhere online she is looking for Historical/Victorian/Gaslamp Fantasy, I add her to my “Agents to query” list. I’m determined to do this right, gentle reader. I go to the SCBWI Conference in Paris with my first 10 pages, and a synopsis. I have a One-on-One Critique Session with an Agent, who requests to read my full manuscript. I finish writing Lily In The Shadows. I revise it based on my CPs/beta readers’ feedback. I enter giveaways and win query critiques, first pages critiques and even a full MS critique. You’d be surprised at how few people enter this kind of giveaways. Yet I cannot stress enough how much it helped me write a stellar submission package – and for free! I send my manuscript to the agent who requested it in Paris. I enter two contests: Christmas In July (organized by the fabulous Michelle Krys and Ruth Lauren Steven) and Like A Virgin (organized by the wonderful Kristina Perez and Rhiann Wynn-Nolet) and to my astonishment, Lily In The Shadows is a finalist in both contests. That same month, I take part in the PitchMas Twitter Pitch Party and I get 3 requests, including one from Erin. Given what happened in July, I decide to throw caution to the wind and to query the 22 agents on my To-Query list all at the same time. I know people say to send only a few queries at a time, and to wait for feedback before sending more, but with the contests’ results I hoped that my query/first pages were good enough. I was READY, lovely reader. I get requests. I get rejections. I get R&Rs. I tweet my pitch again during PitMad and get 5 more requests. I have excited DM conversations with my writerly friends on Twitter. I have depressed DM conversations with my writerly friends on Twitter. I believe in myself. I doubt myself. I’m not sure I’m very productive at work. Things get crazy. I have agents asking me for additional material (aka my other WIPs). I have agents asking me how many agents are currently reading my MS. I have an agent who refers me to another agent. Then on 16th December, Erin emails to ask if I have time to talk. I sign the contract on 13th January. To my Beta Readers: Jani Grey, Bridget Shepherd, Serena Lawless, Kate Michael, Cassandra Marshall, Jenny Perinovic and Marieke Nijkamp. To my cheerleaders: Lauren Garafalo, Rachel O’Laughlin and Aimee L. Salter. To the people who helped with my query/synopsis/first page: Veronica Park, The Writer Diaries, Stephanie Diaz and Stacey Lee. Now that I’m done with the querying process, I’ll be able to blog about topics I avoided before, such as How to deal with a request for exclusivity or with a referral, or What happens during The Call (and what doesn’t), etc. But in the meantime, feel free to ask me your questions below! This entry was posted in Getting published and tagged EM Castellan, Erin Niumata, Folio Literary Management, getting published, literary agents, The Agent Announcement. I’m so incredibly excited and happy for you. I love Lily’s story and I’m glad it’s the one that got you your agent. oh wow!! super exciting!!! congrats!!! Yay for you! You are living the dream I really want to live. I pray and dream it will be in this year 2014 that I follow you. I need to dig through your posts and re-read this one several times to learn your method. Thanks for sharing your amazing timeline! Congrats!!! Thank you for sharing this! Very cool to read! Yayy, Eve! 😀 I’m so happy for you! CONGRATULATIONS!! I’m so proud of you 🙂 Go look in the library. I’m in there dancing. Courtesy of the Tardis. Well done! You give those of us just starting the process hope. Best of luck with the next stage of the journey! I am SO thrilled for you! Yay!!!! The book sound wonderful! Congrats! Congratulations! Thanks for the details of your process. So exciting! Congrats Eve ! I’m so happy for you ! Can’t wait to Know more about it ! woohoo! congrats! what exciting news! I love reading about other writers’ journeys. Thanks for sharing and the best of luck! Such. Great. News. And you couldn’t have deserved it more! Can’t wait until Lily in the Shadows is in print and on the bookshelf! Congrats. That is so amazing. I am so excited for you.